The five signs of skin cancer are very important to keep in mind. With the growing number of people being diagnosed with skin cancer, it is important to know as much as possible about this serious skin care problem. The statistics on skin cancer page provides some skin cancer statistics. Like other types of cancer, early detection is extremely important for successful treatment and the five skin cancer signs are keys in being able to detect skin cancer. Of course, these skin cancer signs are only the preliminary stage of a diagnosis. A proper diagnosis of a skin cancer problem can only be made by a physician and with proper testing being performed. Nevertheless, the five signs of skin cancer are an effective way to initially diagnose a possible skin cancer problem. The five skin cancer signs involve examining the Asymmetry, Border, Color, Diameter, and Elevation of moles or skin growths. The signs can easily be remembered by using the first part of the alphabet – ABCDE. Asymmetry means irregular shape. Dividing the mole in half with an imaginary line, the top half should look very close to the bottom half or the right side the same as the left side if the mole is normal or benign. Therefore, benign or non-cancerous and non-malignant moles are usually symmetrical or look the same on both sides of the dividing line. If the mole is irregular in shape and both sides do not compare well then this is an indication of a possible skin cancer problem. Border refers to the outside edge of the mole or spot. A normal or benign mole or growth has smooth and even outer borders. A problematic growth has borders that are described using many different terms such as notched, jagged, scalloped, poorly defined, uneven, or even blurred. In summary, these terms are simply describing an irregularity or lack of smoothness in the borders of the mole or growth. Color is also one of the five signs of skin cancer. In this case, look for whether the mole has an even color or hue. If the mole has more than one hue, then this could be a cause for concern. Benign growths are generally one color, hue, or shade. Brown is often the normal color, but not always. Cancerous moles can have shades of black mixed into shades of brown or tan. Dashes of red, white, and blue may also appear as the cancer progresses. Diameter or the size of the mole or growth is one of the five skin cancer signs to be aware of. If the growth is larger than 6 mm or a quarter of an inch, then medical attention should be pursued. In relative terms, the eraser on the end of a pencil is about 6 mm in size. Of course, it is less likely, but possible that growths smaller than this size can be cancerous. Any mole growing in size is a concern and should be examined by a medical professional. Completing the five signs of skin cancer is the property of elevation. This last of the five skin cancer signs refers to how smooth the growth is and that it is raised above the normal skin’s surface. Benign moles are generally flat and do not change in size over time. Cancerous moles change in height at a fairly rapid rate. A mole that is elevated and is not smooth (scaliness, erosion or oozing, crusting, ulceration or bleeding may be present) should be classified as suspicious. 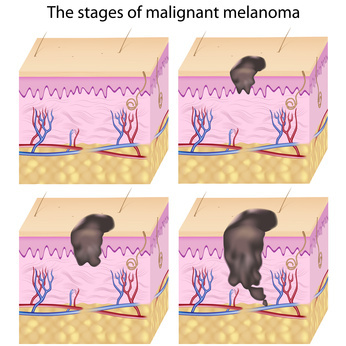 This final skin cancer sign is sometimes also referred to as evolution – the mole is evolving into something else and possesses some or all of the properties described above. If you require more resources after reading the information above, please visit the warning signs page. Finally, if there is any doubt about whether your mole is experiencing changes as described in the five signs of skin cancer, it is a good idea to visit a dermatologist as soon as possible to ensure there is no skin problem. As mentioned previously, early detection is essential for successful treatment. Preventing skin cancer in this first place is the best treatment of all.